There was a big bike race outside my door yesterday. 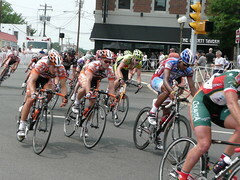 Thousands of people showed up to watch pro cyclists from around the world in the 100km CSC Invitational. What’s the best source to find out about what happened yesterday? Oddly, the answer is flickr. Although the Post ran a blurb telling people that the race was coming, there wasn’t any coverage of the event. On flickr, there were pictures from at least four people (including me) that came up for “csc invitational”. They provide a good cross-section of the race, kids events, featured presenters, some color and the winner. Are the pictures as good as those of a Post photographer? Most aren’t, but some are. But it’s a moot question because the Post didn’t run any pictures from the event. And it’s not just about pictures. YouTube has several video clips from the race. We’ve seen the power of flickr when it comes to big international events like the London Underground bombings. I can only imagine the flood of pictures that would have existed if flickr existed on September 11. I remember going to the “Here is New York” exhibition of pictures from amateur photographers in SoHo shortly after. The Web site offers a pre-flickr view of the impact of ordinary people photographing extraordinary events. Flickr and other social media sites have strong potential to enable ordinary people to cover ordinary events; events that major media outlets don’t cover. They aren’t there yet. In this case, you have to know that the CSC Invitational took place and go search for it. I would love to see a news view of flickr that would show me the most recent happenings in a given area. The building blocks are all there: tags, GeoRSS and geotagging. This entry was posted in flickr, geotagging, google, journalism, media, newspapers, photography, web 2, web 2.0, yahoo, YouTube. Bookmark the permalink.